Ptosis (pronounced toe’sis) describes a “droopy” or “lazy” eyelid where the edge of the upper eyelid (where the eyelashes grow) hangs down too close to the middle of the eye and obstructs vision, much like a shade pulled down partway over a window. More accurately, this condition is called blepharoptosis (bleph = eyelid + ptosis = droop, thus droopy eyelid). Importantly, this is NOT a problem of too much fat or skin or eyelid skin hanging too loosely, so removing eyelid fat or skin does NOT correct eyelid ptosis. This is a problem of an inadequate effect of the muscle which raises the eyelid and determines the eyelid height. Eyelid droop, or ptosis, may represent a weak muscle with which you were born, or it might occur as a result of repeated eye rubbing, contact lens use, trauma, eye surgery, or even just advancing age. Temporary eyelid droop is also seen with boredom, fatigue, and illness. For these reasons, in addition to decreasing the field of vision, causing eye strain, and potentially increasing forehead creases, dry eye, and headaches, a droopy eyelid is often interpreted by others as indicating disinterest, poor health, or lost youth and vitality. Eyelid ptosis is most often a slowly progressive problem where the main eyelid-lifting muscle becomes partially detached from the skeleton of the eyelid. However, other more serious causes include progressive weakness of the muscle or of the nerve that controls the muscle’s action, and so every eyelid ptosis should be evaluated by a knowledgeable physician or eye doctor to be sure there is not a serious underlying problem. Ptosis does not usually improve with time and nearly always requires corrective surgery. In fact, a ptosis which improves by itself is also often indicative of an important medical problem and requires professional attention. 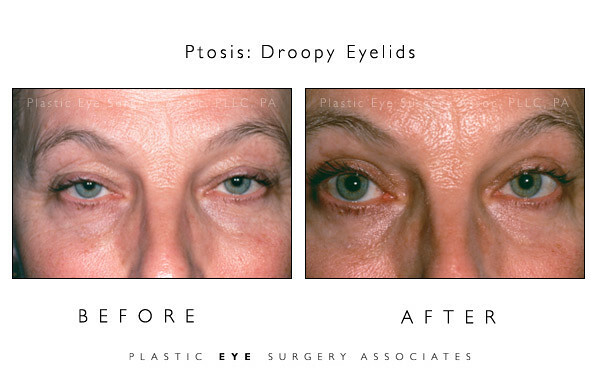 In general, ptosis correction strengthens or tightens the main muscle responsible for lifting the eyelid. In rare cases, if this muscle is especially weak, special procedures involving the eyebrow might be suggested. We have performed thousands of these corrections. Ptosis repair is generally performed comfortably in the office in about 15 minutes under topical and local anesthetic using a well-concealed incision of less than an inch within the eyelid crease. Correction of one or both droopy upper eyelids may improve a “sleepy-eyed” appearance, enhance the field of vision, increase light entering the eye, improve overall visual acuity, ameliorate dry eye symptoms, and resolve end-of-day “tension” headaches / neck aches in people who chronically raise their eyebrows to see throughout the day.